Supplier & Manufacturer of Rotary Joint. Our product range also comprises of Strainer, Heat Exchanger and Cement Storage Silo. We offer high quality products. Innovation is our forte and we strive to design and develop a precision engineered range of Rotary Pressure Joint. Manufactured using excellent quality material, our range is suitable for high-pressure applications. These reasonably priced products can maintain the rotor in perfect alignment. 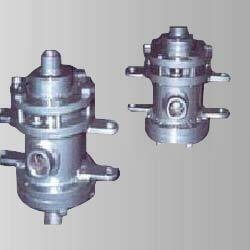 We also offer design of Rotary Pressure Joint. Sizes: 1" to 6" NB.